A man carrying a bike falls over a concrete hump. According to court documents, a California woman is suing SoulCycle for negligence after her instructor allegedly told her to keep pedaling. This led to her falling off of the exercise bike and injuring her ankle. Carmen Farias was taking a class at a SoulCycle in Beverly Hills with her coworkers in June 2014 when she felt her legs begin to weaken. She then tried to stop pedaling, but the bike’s wheels continued to spin. A Harley-Davidson bike is displayed in their head office in Singapore October 13, 2016. Harley-Davidson Inc (HOG.N), facing falling motorcycle sales around the world, said on Tuesday it plans to streamline its operations, reorganize and reduce its workforce during the fourth quarter in a move that will cost the company $20 million to $25 million. The motorcycle manufacturer cited continued slowed U.S. motorcycle industry growth as the main factor for weaker retail sales. After renewing his comedy career with appearances on "Saturday Night Live" and at the Emmy Awards, Tracy Morgan will launch a stand-up tour at venues around the country this winter. Morgan made a surprise appearance at the Emmy Awards last month, with a more substantive turn as guest host on Oct. 17 of NBC'S "Saturday Night Live." A news release described Morgan's comedy tour as getting back on a bike after falling down — "you don't forget where the pedals are." His bookings, from February until the end of May, include some cold weather gigs: Vermont and Ontario in February. 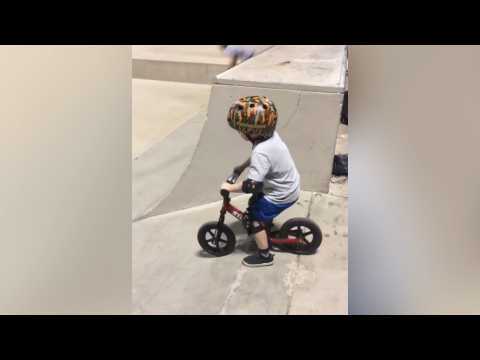 Little boy falls from bike while learning. New York — Michelle Branch and Patrick Carney of the Black Keys are married. The Grammy-winning musicians tied the knot Saturday at the Marigny Opera House in New Orleans in front of close friends and family, a representative for Carney told The Associated Press on Sunday. Branch, 35, wore a dress by Temperley London and walked down the aisle to Elvis Presley's I Can't Help Falling In Love With You, performed by The Symphony Chorus of New Orleans. The couple began dating in 2015. Lyft’s initial public offering headache just got worse. On Wednesday, the company is now looking at two separate lawsuits from its investors. The lawsuits come after Lyft's stock sunk lower than expected after its IPO. Gizmodo reports the stock had an IPO price of $72. Lyft stock now sits at $58.36 as of Thursday. According to Bloomberg, investors allege in their suits that Lyft’s claim to 39 percent market share was maybe not quite in line with reality. A spokesperson for Lyft declined to comment on the lawsuits. Samsung's Galaxy Fold is the company's first smartphone to come with a foldable display. Business Insider reports the foldable display enables the phone to seamlessly switch between phone and tablet mode. The phone has a large 7.3 inch screen and sells for $1,980.00 The Galaxy Fold has a 4.6-inch screen when folded, which feels small compared to other modern smartphones. As a phone, it also feels much thicker than what most iPhone and Galaxy users are accustomed to.